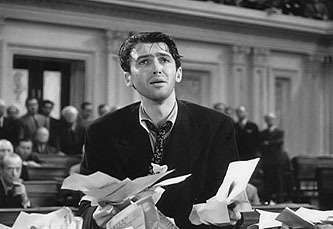 Finally, there’s #5: require honest to goodness Jimmy-Stewart-talk-til-you-drop debate if you want to filibuster a bill. It’s not clear just how this would work technically, but in any case it’s not really much of an impediment to filibusters. If you have 40 senators willing to join in, each one just reads the phone book for an hour or two and then yields. That’s about one hour of phone book reading per week per senator, which is hardly onerous. In fact, it’s so obviously non-onerous that I imagine it changes nothing in practice. Once the minority starts up and demonstrates that it’s willing to engage in a talkathon, the majority will give up and move to other business. Before long, this will morph into the same convention we have now: simply announce that you’re willing to talk and the majority takes you at your word. Overall, then, this is a pretty weak reform package. Items #3 and #4 are worthwhile, but the others are mostly window dressing. The Senate will remain a 60-vote body, but if you can scrounge up those 60 votes then things will move along a bit faster than before. That’s about it.